My latest column for Kirkus Reviews is now online! 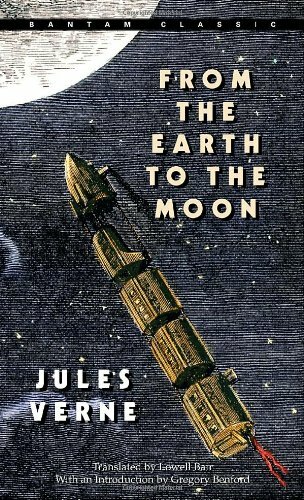 In it, I talk about Jules Verne and his fantastic novel From the Earth to the Moon. I recently talked about Jules Verne in his influences that stemmed from Edgar Allan Poe, and I was particularly eager to return to Verne as a major influence in the genre. As July is the month where the anniversary of the first Moon landing rests, it seemed like a good time, although Verne's novels are closer to what happened with Apollo 8, when we first reached the moon, rather than landed on it. You can read the entire post here on the Kirkus Reviews Blog. Billion Year Spree, by Brian Aldiss: Once again, this book provides some good background on Verne throughout, and some of the things that helped to influence him and this particular novel, especially Poe. The History of Science Fiction, by Adam Roberts: Roberts takes to task the idea that Verne 'predicted' how the space program would be put together, and lambasts critics who nitpick Verne's story based on some of the things that he didn't get right - such as using a giant cannon to get into space as opposed to that of a rocket. It's a good perspective to understand, that Science Fiction doesn't predict the future, but if the author is paying good attention to science, it's not likely to change all that much, as is what happens in this situation. Survey of Science Fiction Literature, Vol 3, by Frank Magill: Magill's collection provides a great analysis of From the Earth to the Moon in its themes and influences. To a Distant Day: The Rocket Pioneers, by Chris Gainor: This is a great history (and part of a great series on human space exploration, the Outward Odyssey series), on the development of Rocket Science. This book points to a number of rocket pioneers who read Verne's stories and looked at how they could do that in real life. Verne's an excellent example of where fiction becomes real. Jules Verne, inventor of science fiction by Peter Costello: This biography of Verne was a particularly good one, outlining much of Verne's life and some of his influences when it came to science fiction and storytelling. He's a facinating individual, and the book provides a good overview. From the Earth to the Moon and Round the Moon, Jules Verne: Of course, there's the source material, in this instance, a nicely bound collected edition that my wive brought with her when she moved up to Vermont. This edition has several other books, and I look forward to someday reading it to whatever children we end up having.